It’s time to rewind the clock back to the 1990s for this month’s interview. 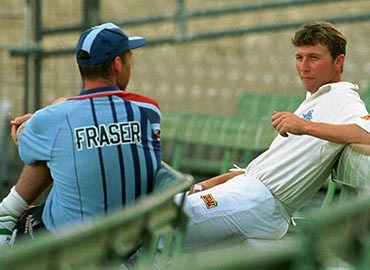 A bowler who was consistent, hugely accurate, a wicket-taker and someone who, but for injury and strange selection decisions, should have played many, many more Test matches for his country, Angus Fraser. And with the recent tour of the West Indies drawing to a close, it seemed a good place to start our discussion, particularly given Gus’ success in the Caribbean. In 17 Test matches against the West Indies home and away, he took an incredible 70 wickets at average of just 23.70 and at an economy rate of 2.69. So, what made him so successful, particularly on those Caribbean pitches and against arguably one of the strongest sides (and batting line-ups) to have ever played the game? Many more West Indies stories to come, including that 46 all out “which I was the not out batsman, remember!” but, as with all of our interviewees let’s rewind to those early days. What was Gus’ cricketing upbringing? And who were some of those early cricketing heroes? Gus and his brother followed in his father’s footsteps and both pulled on the Stanmore sweaters. Yet, it was his brother who made the bigger initial impression. Gus made his debut for Stanmore’s 1st XI at the age of 16 his performances in the Middlesex League soon got noticed by Don Bennett, the Middlesex coach. And what was it like walking into a successful Middlesex environment that contained famous names such as Gatting, Butcher, Radley, Downton, Emburey, Edmonds, Cowan, Williams and Daniel? And what made Middlesex such as successful side in your early years? In Gus’ time as a player at Middlesex, the side won numerous one-day titles and cups but the icing on the cake were 3 county championships. One of the keys to success was the side’s ability to evolve, quickly. And with all the success that the side achieved, what were some of Gus’ early Middlesex highlights? Gus’ performances for Middlesex saw early international recognition when he was selected in the squad for the second Test of the 1989 Ashes series at Lords. Gus wasn’t picked in the final eleven, but finally did get his chance, one Test later at Edgbaston. I asked Gus how important is to get early success when you make a debut? 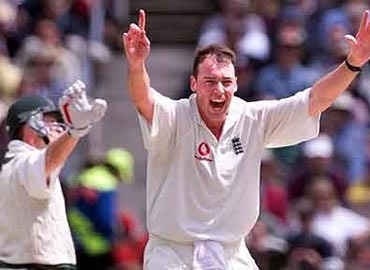 Gus ended up with 9 wickets from his 3 Tests in that series and was one of England’s bright light in what was a heavy Ashes series defeat. Towards the end of that 1989 Ashes series, David Gower stood down as England captain and was replaced by Graham Gooch in what many hoped would a new dawn for English cricket. Gooch’s first task as captain was to lead England on a tour to the Caribbean and a series against the formidable West Indies. 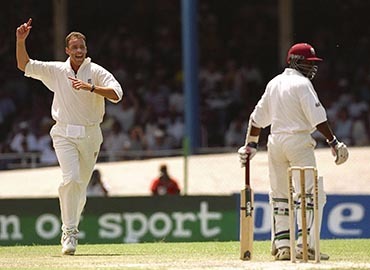 England famously won the 1st Test in Jamaica, with Gus’ 5/28 from 20 overs in the 1st innings playing a huge part in bowling the West Indies out for just 164. A side that contained so many great West Indian batsmen. England lost the series 2-1 but had restored pride after the heavy Ashes defeat and in Gus and Devon Malcolm, England had found an opening partnership that SHOULD have gone to become one of England’s best opening partnerships. I asked Gus if he felt if central contracts were around for that group of players, how much a difference that would have made. The summer of 1990 saw England beat India at home. People always remember Graham Gooch’s famous 333 at Lords, but Gus’ 8 wickets in the match went a long way towards the side winning by such a big margin. A winter tour to Australia followed and after Gus’ 6/82 in the Boxing Day Test at Melbourne, many believed England had unearthed a truly world class opening bowler, someone who would go on and have a long career for his country. It was an injury that was career-threatening. The injury kept Gus out of the England side for nearly 3 years. 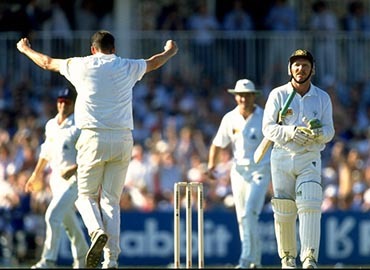 He returned to the side for the final Test of the Ashes at the Oval in 1993 and he carried on where he left off with 8 wickets in the match (a 5-wicket haul in the 1st innings) in what was a man of the match display, as England went on to secure a consolation victory over the Australians. 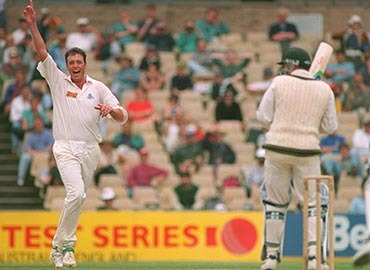 The winter of 1993/94 saw England return to the West Indies, this time under the captaincy of Mike Atherton and once again Gus didn’t disappoint with 16 wickets in 4 Tests. This was the series that was famous for the 46 all-out in Trinidad and the win in Barbados where the West Indies had not lost for decades. Let’s start with the 46 all out! And not forgetting of course, Gus’ own 8/75 in the first innings as England restricted the West Indies to 304 in reply to England’s 355. Gus’ comeback was going from strength to strength, but less than 12 month’s later, he was incredibly left out of the 1994 Ashes squad entirely. New ‘supremo’ Ray Illingworth thought Gus didn’t have the pace needed to unsettle Australia’s batsmen. He instead preferred the raw pace of Kent seamer Martin McCague. It was kick in the teeth for Gus, whose previous tour down under showed just how effective he was in those conditions. As fate would have it, there were injuries and Gus was called into the squad prior to the 1st Test in Brisbane. Gus didn’t play, but he was recalled for the Test match at Sydney and he proved a point to Illingworth in the best possible way, by taking wickets. As England battled for victory, Gus bowled an outstanding spell of 5/73. It wasn’t quite enough to get England over the line, but it was the perfect response. Gus continued this form the following summer against the West Indies. His 5/66 at Lords (which helped England to victory) and his 4/45 at Old Trafford (in a 6-wicket win), were just two of his important contributions. However, the Illingworth curse struck again in South Africa, when despite taking 3 wickets in the second innings of the Johannesburg Test (remember Atherton and Jack Russell! ), Gus was again left out of the side, this time for two years. Some would say, a harsh way to treat a bowler who had regularly proved his value. It wasn’t the for Gus in an England shirt. 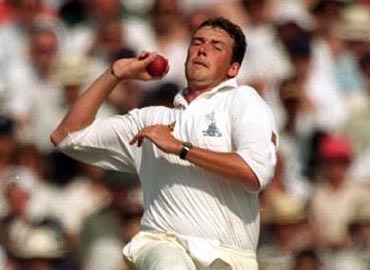 With Illingworth gone, Gus was recalled, unsurprisingly, for the 1998 tour of the West Indies in what was to become a memorable year for the seamer. And for Gus it was an outstanding tour with the ball, taking 27 wickets in the series, including 11 in the win in Trinidad. When Gus talks of some of these spells, I can imagine how frustrating it must have been knowing that a lot of his big performances for England would often get overshadowed by notable performances of others. 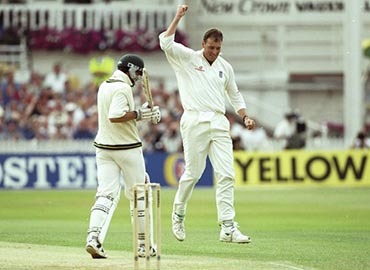 For example, in this Test at Trent Bridge people remember it for Donald/Atherton rather than Gus’ 10 wickets. People remember Lords in 1990 against India for Graham Gooch’s 333 rather than Gus’ 8 wickets or the win in Barbados in 1994 for Alec Stewart’s two hundreds rather than Gus’ 8 wicket spell. But I guess, that’s professional sport. It was fair to say Gus was back and he headed down under to Australia that winter full of confidence. What he didn’t realise was it would be the final time he’d pull on an England jersey. In 2000, with his England career behind him, Gus took over the captaincy at Middlesex. And how was the world of the media? Gus combined his role at Middlesex with being on England’s selection committee. A role he proudly held from 2014 until 2018. I asked Gus if he could give supporters an insight into a typical selection meeting, maybe one for a tour squad. And what a cricketer that was. Thanks for the memories Gus!